Chef Gareth Fulford comes from a family of butchers and has been working as a chef since his 16th birthday in numerous kitchens across the UK and going on to become one of Cheltenham’s top chefs at Purslane restaurant. Coming from a butcher background, it is perhaps unusual that Purslane focuses on British seafood with Cotswold produce.Yet he believes his love of fish comes from the fact that seafood was a rare luxury at a butcher’s dinner table. Before settling in the Cotswolds, Gareth spent five years working at prestigious events cooking for royalty and various A-list celebrities. He moved to the Cotswolds to work at a top-quality gastropub before realising his dream of opening his own restaurant in 2012. 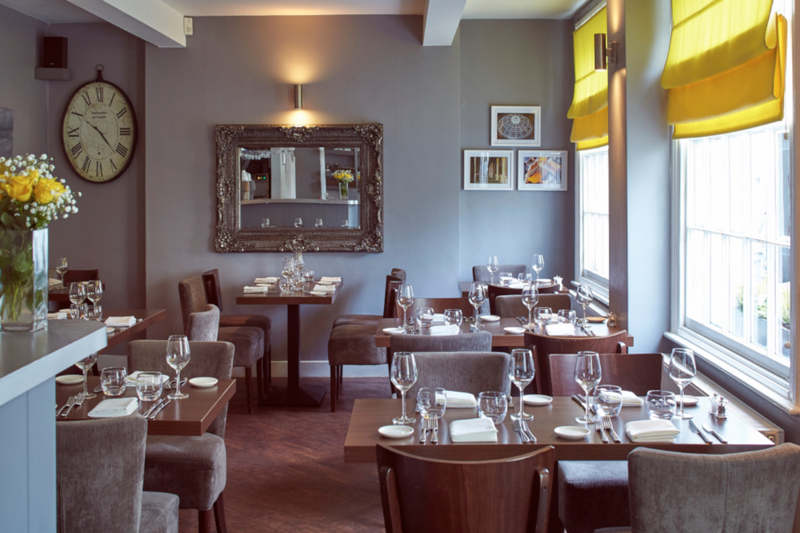 Gareth opened Purslane restaurant in 2012 with business partner Stephanie and wife Helena. He sources seasonal produce from smallholders in Cheltenham and the surrounding area, finding out exactly where all of the ingredients come from and how they are grown, reared or caught. 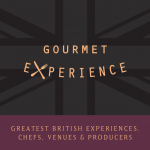 Gareth has won a host of awards over the last five years including: Good Food Guide score of 6 in 2016; Best Chef at the Taste of Gloucestershire Awards 2015. He and Purslane were shortlisted for Best Chef and Best Restaurant at the Cotswold Life Food and Drink Awards in 2014, and The Good Food Guide ranked Purslane as the 69th best restaurant in the UK. Stylish, neighbourhood restaurant serving a creative menu focused on sustainably caught seafood. For the mackerel, boil brine ingredients until sugar and salt has dissolved and then leave it to cool. Place the mackerel fillets in brine for 10 minutes then wash off and pat the mackerel dry. Next, boil beetroots in separate pans until tender. Wash under cold water and then peel. Keep them separate to prevent the colour running between them. Use a parisienne scoop to pearl the beetroots. Keep the trim from the beetroots and puree in a liquidiser with a splash of good quality red wine vinegar and season. Wash the rhubarb and cut it into 5 centimetre batons. Boil the pickle ingredients and pour hot onto rhubarb, then leave to cool. For the panna cotta, blanch the alexander leaves in boiling salted water then refresh in iced water and drain when cold. Blitz with the milk and pass through a fine sieve. Warm the cream to a simmer. Soak the gelatine leaves in cold water for 10 minutes to soften then add the drained gelatine to the cream and dissolve off the heat. Add salt to taste. Add the Alexander milk to the cream mixture, stir to combine and set in a plastic container. To serve, place the beetroot puree artistically on the plate. Dress the beetroot pearls with some extra virgin rapeseed oil and season with salt and pepper then arrange them on the plate. Lightly oil and season the skin side of the mackerel. Place on a tray under a hot grill and cook until the skin is golden and crispy and the flesh is just cooked through. Squeeze some lemon over it and place on the plate. Add a spoon of the Alexander panna cotta. Drain the pickled rhubarb batons and plate them. Finish the dish with Alexander leaves. 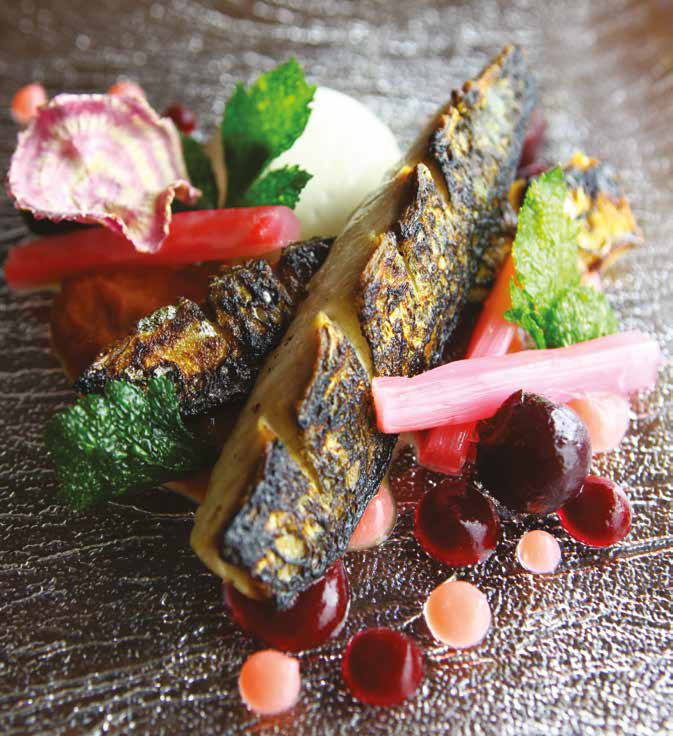 This recipe is featured in our book Signature Chefs South West & Channel Islands. Click here for more information. 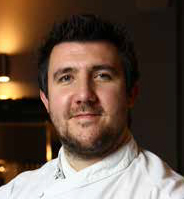 Click here for more information about Chef Gareth Fulford.